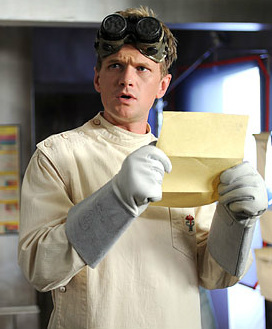 A friend wanted to dress up like Neil Patrick Harris in "Dr. Horrible's Sing-a-Long Blog". He managed to secure all of the pieces of his costume, right down to the goggles, but needed a bit of help with the lab coat. It's hard to see from the photo, but the details on the coat are pretty good, if I say so myself. There's a caduceus on the breast pocket, and the coat buttons along the shoulder and side. I'm not usually very good with collars, but I think I nailed it on this one.